This chicken bone broth recipe isn’t just delicious and loaded with minerals and gut-loving gelatin — it’s also incredibly simple to make! 2) Was WAY too intimidated to give it a try. There was all this talk about the knuckles and joints and feet having the most gelatin (where was I supposed to find these?) and roasting the bones (you mean I have to cook it before cooking it!?) and then letting the broth simmer for up to 24 hours (when would I be home long enough to make sure the house didn’t burn down?). But I pulled up my big girl pants and said “Nadia, you can do this.” I drove 45 minutes to the nearest butcher that carried grass-fed beef bones, knuckles, and joints. I came home and roasted them all up. I put them in my slow-cooker with some veggies and spices for 24 hours, while I remained home, in close proximity to the fire extinguisher just in case (#anxiety). I made myself a delicious batch of bone broth. It jiggled in all of its gelatinous glory and I was proud of myself. I had done it! I had made bone broth! And then… I never made it ever again. Well, at least not the same way. Because if you know me, you know I’m a pretty lazy cook. Don’t get me wrong: I LOVE yummy, healthy foods but don’t want to spend hours slaving away in the kitchen to make them happen. I definitely don’t want to spend 45 minutes driving to the butcher every month to restock my freezer! So you bet that I’ve come up with a super simple way to make bone broth that’s of course delicious and packed with all of the amazing health benefits. It’s also a really economical option since I use the leftovers (the bones and skin) from 2 organic rotisserie chickens. Rotisserie chickens are a staple in my house — I buy one each week and keep it in the refrigerator to pull from when my husband and I need to make a quick meal. So whereas most people throw the bones and skin out after eating all of the meat, I instead use mine to make broth! It’s really getting the most for your money. Optional: garlic, pepper, or any other spices you like! * Remember: you are what you eat eats. Choose organic and pasture-raised bones for bone broth, since they have a higher mineral content. ** If your slow cooker or crockpot holds less than 6-quarts, you will need to use fewer ingredients or less water. If your slow-cooker or crockpot holds more than 6-quarts, you can use the same quantity of ingredients OR choose to add more to fill your crock to capacity. You may need to do some estimating, depending! Chop the carrots, celery, onion, parsley, and rosemary (if using fresh herbs). Place the chicken bones, vegetables, and herbs in your slow cooker. Fill the rest of the slow-cooker with water (about 14 cups). Add the apple cider vinegar to the slow cooker as well. Place the lid on the slow cooker and set to low. Set the kitchen timer for 1 hour. After 1 hour, take a peek at how your bone broth is coming along! If there’s any foam at the top, skim this off with a spoon and discard it. Set the timer for another 11 hours. After 12 hours total of cooking, turn the slow cooker off. Ladle the broth from the crock pot into mason jars or heat-proof glass food storage containers. If using mason jars, a funnel with built-in strainer is most convenient to filter the ingredients from the broth. If using heat-proof glass food storage containers, a mesh strainer is more convenient. Reheat the broth whenever you’d like! Best consumed within 5 days (otherwise, you may choose to freeze it). A note about cook time: I’ve found that 12 hours is the sweet spot for my slow-cooker — any longer, and it actually overcooks and the gelatin is broken down into amino acids (you will know when this happens because the broth is liquid when cold rather than gelatinous). Depending on your slow cooker, you may need to cook your broth for a little longer. It’s an experiment, but a fun one! And not nearly as painstaking as driving 45 minutes to a butcher (still can’t believe I did that). Have you tried making bone broth yet? If not, does this recipe inspire you to give it a try? Please let us know below in the comments! When you say 2 organic rotisserie chickens, do you mean what’s left over after we’ve eaten the good parts?! I’ve made broth before and would hate to discard all the meat. Just wanted to be sure. Oh yes! The bones (and skin if you don’t eat it) that are leftover. Sorry for the confusion! I’ll go back and make that more clear. Sounds delicious! I tried this once by cooking a whole chicken in the crockpot with very little liquid. I saved the broth from that. I used it on everything I ate. How do you use your broth? And yes I want to make this again this weekend. Thanks for sharing again! Most often, I just reheat it and drink it! 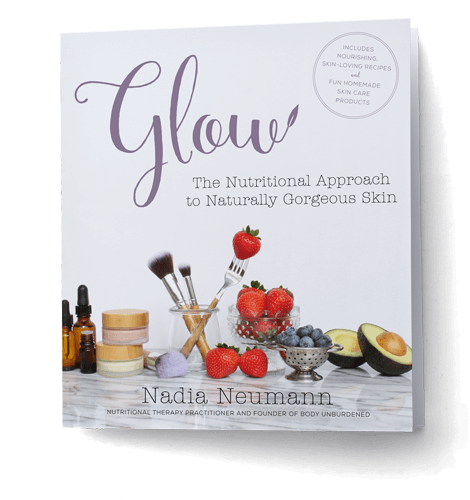 It’s great for gut health and the immune system (and your skin, hair, and nails!). Sometimes, I’ll use it to make soup or cook rice. Hi Nadia, I just came across your book in TJMaxx and I can’t put it down. 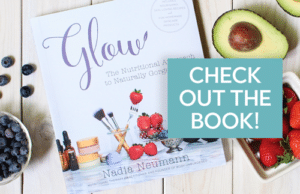 I am a health coach student (hopefully a health coach soon – yikes!!) and I am thrilled and inspired by your work. All the best and thanks for your refreshing, easy-to-read and inspiring work. I’ve been wanting to make bone broth for a while (I’m 66 and could do with the collagen) and this way seems easy enough to have a go. Thank you. Pingback: So What's The Deal With Collagen? What Is It & Is It Worth The Hype? I bought the Perfect Supplements bone broth as you recommended in one of your posts and I was wondering if perhaps you have any recipes I could use with that instead of the actual bones?